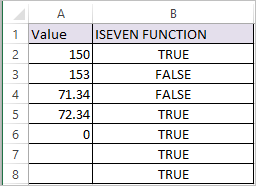 ISEVEN Function in Excel tests if a supplied number (or numeric expression) evaluates to an even number, if so then the Function returns TRUE, if not the function returns FALSE. Excel ISEVEN Function, also considers Even Decimals as even numbers. So 72.34 is considered as Even.